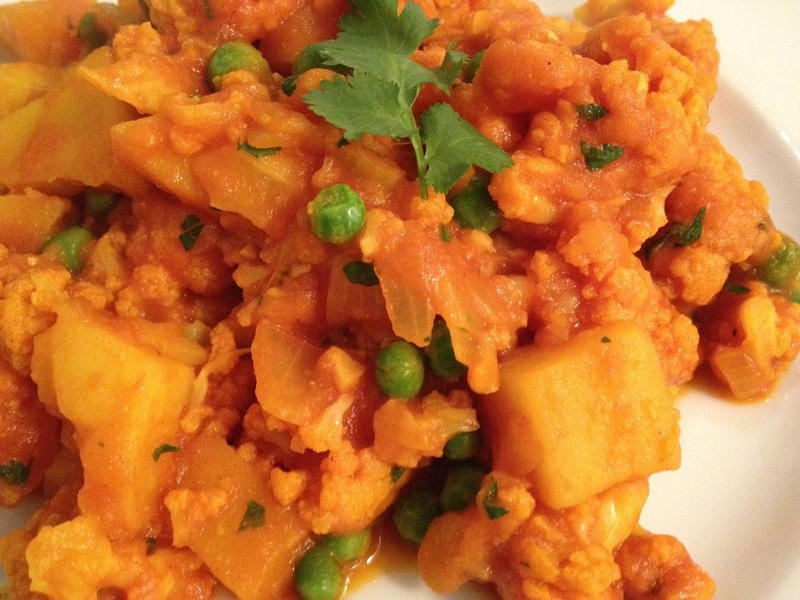 It’s Indian night inspired by fellow blogger at Karen’s Vegan Kitchen. Dice the onion and sauté in a soup pot in sunflower oil until soft. Mince the garlic and add to the onions. Cook on a low flame until soft and fragrant. Peel and cut the potato into small chunks and break up the cauliflower. Add to the pot and cover with tomato sauce and vegetable stock. Add seasonings and bring to a boil. Cook until the potatoes are just tender. Add the peas and cook for a few minutes more. Adjust salt and pepper. Take off the flame and let it sit for a few minutes. Chop the cilantro and mix through. Enjoy! That looks delicious and I love the way the russet potatoes soaked with the sauce!